What is Your Horse’s Typical Day Like? “At six every morning, Dexter has all the water he wants, and two quarts of oats. After eating, he is ‘walked’ for half an hour or more, then cleaned off, and at nine has two quarts more of oats. If no drive is on the card for afternoon, he is given a half to three quarters of an hour of gentle exercise. At one o’clock he has his oats again, as before, limited to two quarts. “From three to four he is driven from twelve to fifteen miles; after which he is cleaned off and rubbed thoroughly dry. He has a bare swallow of water, on returning from the drive, but is allowed free access to his only feed of hay, of which he consumes from five to six pounds. Shedding horses, green grass, the return of the meadowlarks . . . spring is here! When I go to bed each night, I am often rehearsing all the things I want to do the next day as I slip into dreamland, and when my feet hit the floor every morning, they are in high gear. This is the beginning of a new horse season and it can’t start too early for me. Mother Nature, however, can bring some interesting events to the mix. We usually have our deepest and wettest snowstorms during March, April, and even May. So although I am revved, I always need a backup plan in place if the weather makes it unsafe or impossible to train or ride. The horses are all brought in from winter pastures in March, if not before, to allow the land to rest and the plants to grow. Each horse has his own separate sheltered pen. I bring the horses back into work one at a time, starting with a grooming program. I might vigorously groom a horse daily to remove as much of the shedding hair as possible, or in some cases, I might bathe a horse in early March and give him a body clip. (See more about body clips in December.) Until a horse is 95 percent shed out, I usually don’t put a sheet on him. Then I either give him a turnout sheet or a fly sheet, depending on the weather, to protect his coat. The horses are still on a 100 percent hay ration, but I cut back a bit to help them start to lose their winter fat and hay belly if they have one. Because they are in pens, they require exercise, so I review in-hand and longeing to get them back into work mode. I pay attention to each horse’s specific needs for conditioning and adjust rations as needed. Horses in training are kept shod, and even some that are not in training are kept shod to protect their hooves from our abrasive Rocky Mountain terrain. It is great having a resident farrier! This time of year, the horses are fed three times per day, at 6:00 a.m., noon, and 7:00 p.m. The seniors are still getting their beet pulp and supplements, and the rest of the horses receive beet pulp with additives as their level of work dictates. Spring makes us all feel great. I’m spending lots of time outdoors. I always wear a broad-brimmed hat, bandanna around my neck, gloves, and long-sleeved shirt. This is mainly to protect my eyes and skin from sun damage. I often find that from this time of year through fall, I get plenty of varied exercise from chores, grooming, training, riding, mowing, and facilities maintenance tasks, so the indoor exercise equipment gets a little dusty over the summer. The early mornings and late afternoons can still be a bit chilly, so mainly for my horse’s sake, I try to do vigorous training and riding either mid-morning or mid-afternoon, giving them plenty of time to cool out thoroughly before chilly evening temperatures. 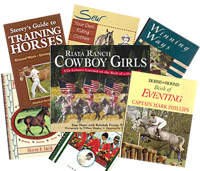 Visit our Good Horse Books site for new, used and collectible horse books – Buy one and get TWO FREE. Where is the summer going ??!! I can’t believe August is nearly half gone. But no matter what month of the year, we horsekeepers are busy ! Here are a few things pertinent to August here on Long Tail Ranch. These are excerpts from my book Cherry Hill’s Horsekeeping Almanac. Fall is a good time to have routine dental work completed: floating teeth, removing wolf teeth if necessary, and removing retained caps. Because a horse’s upper jaw is wider than the lower jaw and horses chew from side to side, as their molars wear, they form sharp points on the outside of the upper molars and the inside of the lower molars. To keep these sharp points from cutting your horse’s tongue or cheeks as he eats, they should be filed (floated) regularly with a special file called a float that attaches to a long handle. At the same time, your vet can remove caps and/or wolf teeth. Caps are temporary premolars (baby teeth) and molars that have not completely dislodged even though the permanent ones have erupted. In between dental visits, monitor your horse to determine if he needs more frequent visits. Use the following procedure to remove a shoe that has become bent, dangerously loose, or has rotated on your horse’s hoof. Necessary tools include : clinch cutter, hammer, pull-offs, and crease nail puller. Using the chisel end of the clinch cutter, open the clinches by tapping the spine of the clinch cutter with the hammer. A clinch is the end of the nail folded over; this needs to be opened so that the nails can slide straight through the hoof wall when pulled without taking large hunks of hoof with them.If the shoe has a crease on the bottom, you may be able to use the crease nail puller to extract each nail individually allowing the shoe to come off.Nails with protruding heads can be pulled out using the pull-offs. If you can’t pull the nails out individually, then you will have to remove the shoe with the pull-offs. After the clinches have been opened, grab a shoe heel and pry toward the tip of the frog. Do the same with the other shoe heel. When both heels are loose, grab one side of the shoe at the toe and pry toward the tip of the frog. Repeat around the shoe until it is removed.Never pry toward the outside of the hoof or you risk ripping big chunks out of the hoof wall. As the nail heads protrude from the loosening of the shoe, you can pull them out individually with the pull-offs. Pull any nails that may remain in the hoof. Protect the bare hoof. Keep the horse confined in soft bedding. Four to six grams of blister beetles (whole or part, fresh or dried) can kill and 1100 pound horse. That’s because they contain cantharidin, a toxic and caustic poison. There is no antidote. Research has shown it is the striped blister beetle that is the source of cantharidin. Typically, blister beetles will appear after the first cut (mid June or later) and disappear by October, so usually first cut and last (late 4th) cut hay is safer than 2nd or 3rd cut. Blister beetles tend to cluster in large groups often in the area of 1-2 bales but hay growers know that if left alone after cutting, most blister beetles evacuate the field. You need to know your alfalfa hay grower; ask him what he did to eliminate blister beetles in the field. Buy only first cut or October hay. Inspect alfalfa hay before you buy and again before you feed. Riparian refers to the vegetation and soils alongside streams, creeks, rivers, and ponds. These are precious areas that can easily be damaged by horses. Manure, urine, overgrazing, destruction of trees, and the creation of muddy banks all can lead to less vegetation, warmer water temperatures, more algae, less fish, and decreased wildlife habitat. Monitor and limit horses’ access to natural water sources so that a natural buffer zone of grasses, brush and trees is preserved around the edges of ponds and creeks. This buffer zone is essential for filtering nutrients from excess runoff before it enters the water. Choke cherries are ripe during August. Although horses don’t eat the berries, the leaves are poisonous to horses and the berries attract bears.